Healthy articular (joint) cartilage is crucial to joint utility. Cosequin helps support cartilage production and protect existing cartilage from breakdown. The only joint health supplement brand shown effective, safe, and bioavailable in published, controlled U.S. studies, Cosequin is manufactured following standards similar to those practiced by the pharmaceutical industry. 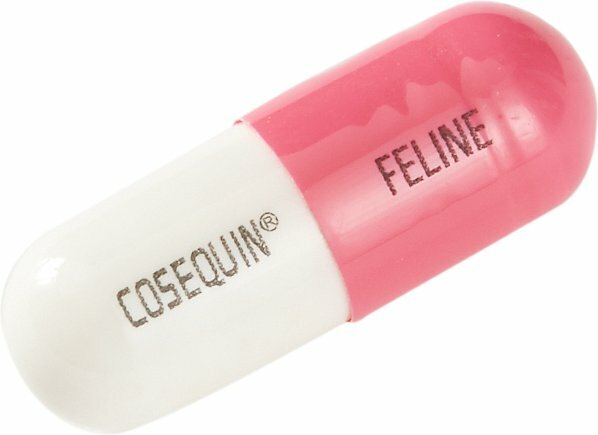 Cosequin has been proven safe in cats. 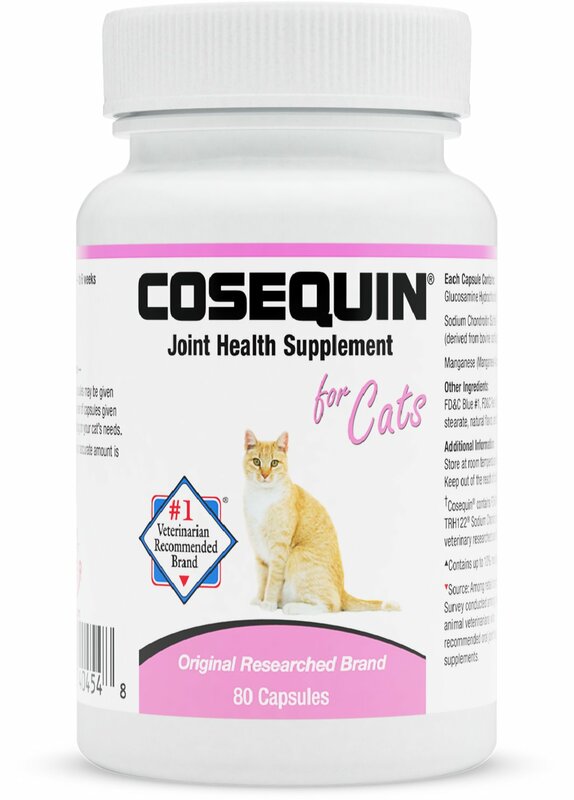 Cosequin, a nutritional supplement, safely and effectively provides joint cartilage support while maintaining your cat’s comfort level. Some veterinarians also recommend Cosequin to help support urinary bladder health. Each Capsule Contains: Glucosamine Hydrochloride* Minimum (125 mg), Sodium Chondroitin Sulfate* Minimum (100 mg), Manganese Minimum (1 mg**). 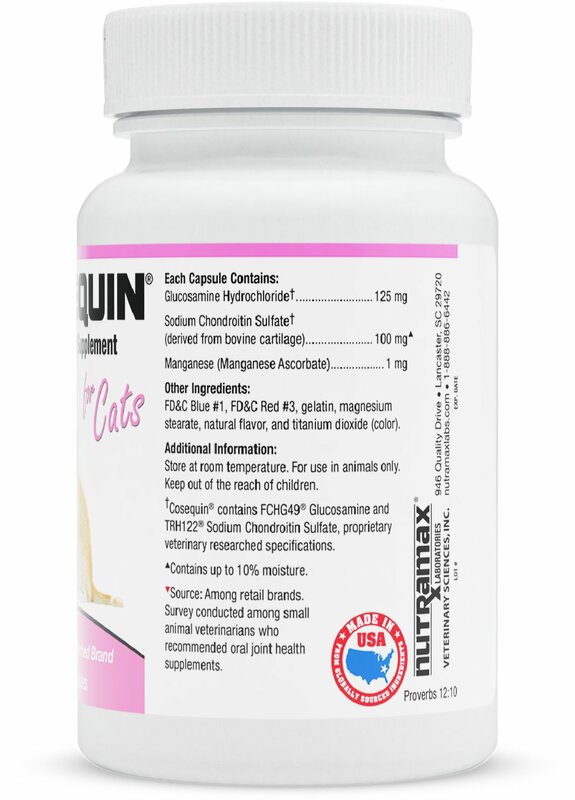 *Cosequin Contains Fchg49 Glucosamine and Trh122 Sodium Chondroitin Sulfate, Nutramax Laboratories Proprietary Veterinary Researched Specifications. Reported On A Hydrous Basis. ** from Manganese Ascorbate. Nutramax makes unique supplements that are formulated specifically for cats to keep them in their best health. These high-quality supplements help support your cat's general wellness with easy-to-administer tablets, soft gel caps, sprinkle capsules and liquids that are made for joint, liver, digestive, and skin and coat health. Nutramax feline wellness products help your cat stay young at heart so she can keep playing and purring for years to come. 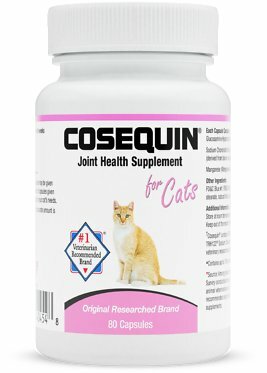 Cosequin is the number one veterinarian- recommended brand for joint health. There are plenty of success stories from pet parents who have seen the remarkable difference this supplement makes in their cat's mobility, ease in movement and overall playfulness. It's formulated with a trademarked combination of ingredients, including naturally derived glucosamine and chondroitin, and comes in a convenient capsule that you break open and sprinkle on top of your pet's food. Whether your kitty has a temporary case of upset stomach from travel or boarding stress, antibiotics, trying a new food or just having a sensitive system, Proviable helps put things back in balance. Nutramax Proviable-DC for long-term support: These capsules offer natural support with seven key probiotics and two prebiotics to help get the digestive system back on track. Nutramax Welactin Feline contains high-potency fish oil with substantial amounts of EPA and DHA, two omega-3 fatty acids responsible for skin and coat health. These important omegas not only help combat dry skin, but they also support the kidneys, brain and vision health, and a strong immune system. Many pet parents see improvement in their cat's appetite, alertness and overall appearance when they try Welactin. Great for older kitties and active younger babies! Have tried in the past to give this powered form to my multi-cat household. Am trying, again, with more effort this time. Mixed in with wet food this stuff is 'gone'. Adding to dry is more unpredictable, they may dodge it. Bottom line: if Cosequin does 1/2 of what it proclaims, then, at this low cost, it is worth a shot. Cats are NOT easy to figure....if this does give them a boost, again at this cost, it is worth trying. Best of luck to all cat caretakers! Our Tinkerbelle is 16 years old overall in great health. She has a little authoritis in her back hips. We started giving her this product 3 times a week. We seen immediate results. She is back to running up and down our 9 deck step for good chew on the grass. I used to give my cats glucosamine (sp?) for humans. It helped a little, but then my sister gave me a bottle of Cosequin, and it really helped my 16 & 17 year old cats! They hardly limp at all. Sometimes they even run around with their younger brother cat. This is a great product. I just wish it came in a bigger size. I have tried paste and treats to help with hip dysplasia and none have helped since my cat wouldn't eat them. Stairs were becoming a problem for her and her lack of exercise from pain was causing weight issues. NOW I sprinkle this on her dry food each morning and she loves it! Licks the bowl clean! And she runs and plays again. Last 3 lbs in just a few weeks because she can play again. I open the capsules and sprinkle it on a small amount of wet food, then top it with another tiny layer of food. Both of my kitties eat it with no problems. They are 10 and 12 years old, and while neither of them are exhibiting signs of joint pain, I want to stay ahead of things. I can’t speak to the efficacy for these two, but a previous senior kitty who has passed on benefited greatly from this product. This took about a week before I saw improvement. This is great as a preventive for arthritis and for mild arthritis/little stiffness. I also doubled the dose for the first two weeks. My cat definitely became happier and more active once it kicked in. For arthritis that is worse than above, I’d recommend something stronger like arthrisoothe gold level 3 liquid. I have used this product for a couple of years to help my 13-year old cat, Buster, get some relief from arthritis in his hips. He still can't jump the fence, but that's a good thing. I give this to my older Persian. I just take the capsule apart and sprinkle it into her cottage cheese. Her predecessor did excellent on this. At 15 he was still jumping off my chair with ease!